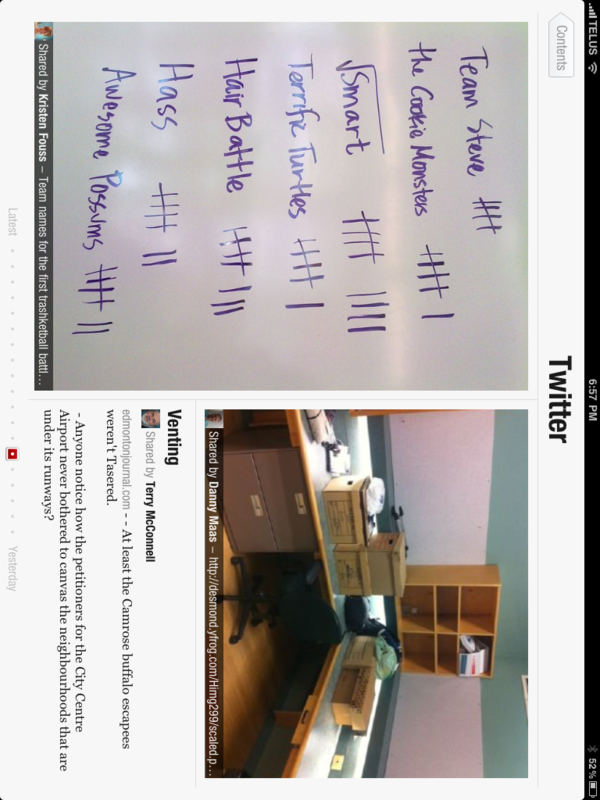 When I got back to work on Monday, my boss and another consultant both showed me Flipboard for the iPad. I installed it on my own iPad (it’s a free app) and I can’t stop raving about it. Flipboard is an app that takes your social networks (Facebook and Twitter for me) and presents them in a pretty slick magazine format. It totally enhances my Twitter experience. 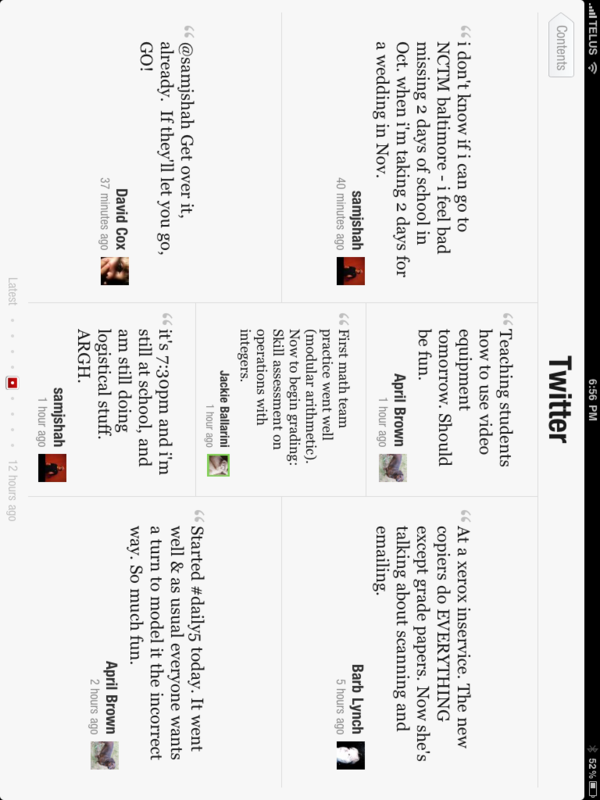 Here are some screen shots from my iPad, so you can see what Twitter looks like for me now. These first four shots show how it takes a tweet that includes a link, and instead of showing something like http://bit.ly/bybT2U, it actually pulls in a preview of the photo or article that is linked, so you can read a few lines and decide if you want to read further, which you can also do right from within Flipboard. 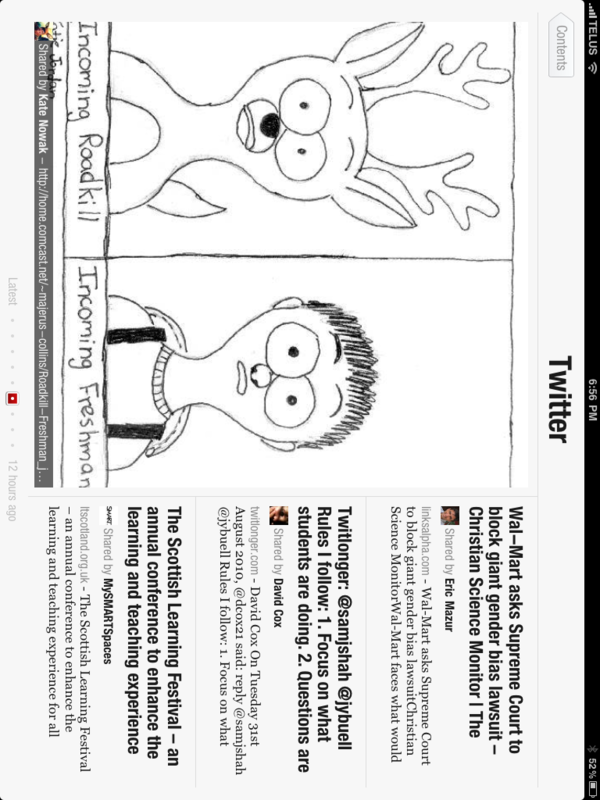 The last two screen shots show what tweets look like when they don’t involve links. While I highly recommend this app, there are some drawbacks to it. I can reply to tweets, but unless I’ve missed it, there is no way for me to write a new tweet directly from within this app. 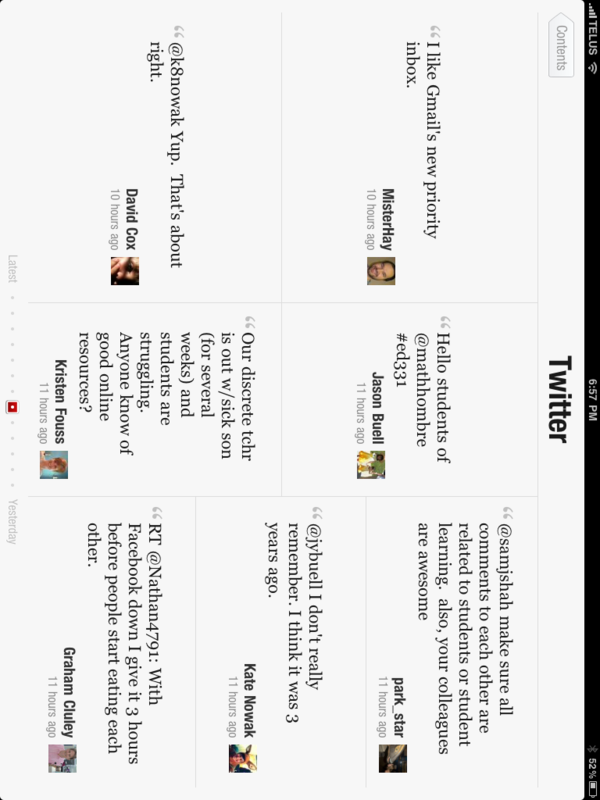 Another drawback is that the tweets get inserted where they fit, so some of the linearity of Twitter is lost. 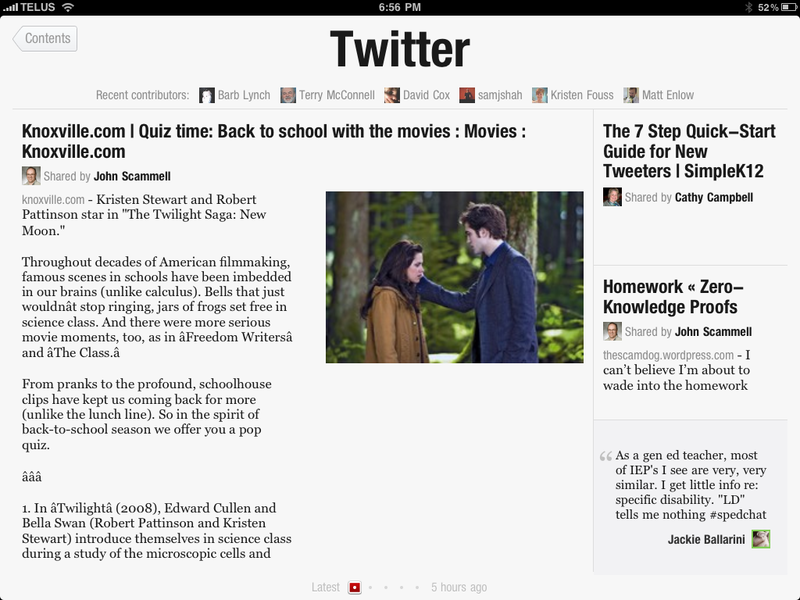 My biggest wish, though, is that it would have the ability to be an RSS aggregator. 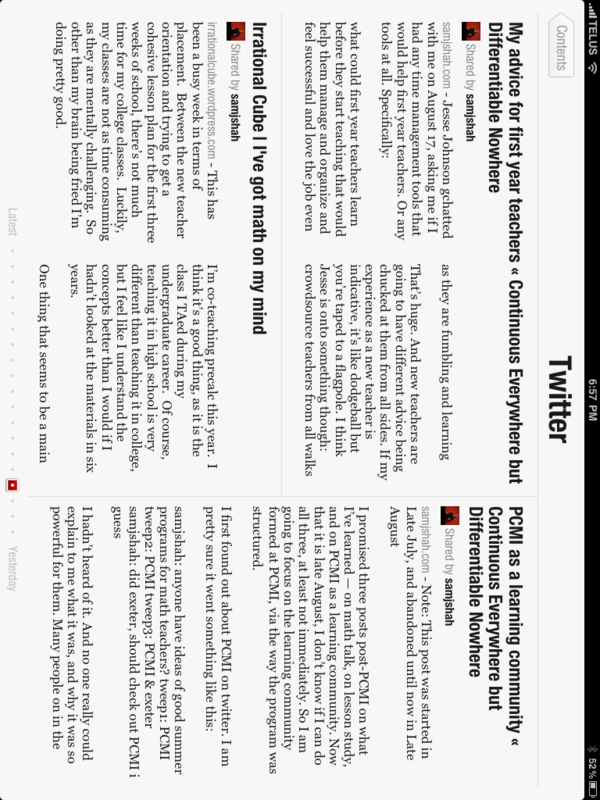 I’d love to be able to browse all of the great blogs I follow in a similar format. It looks much like a magazine, and I could check out blog posts in a much nicer format than I currently use (mail client on mac).